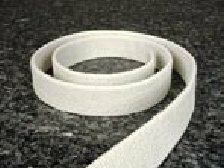 Tuff-Flex™ This high temperature and heat resistant tacky cloth gasket tape is a widely used and universal tape for making gaskets, especially where a rough or uneven surface or flange exists. The fabric is a fiberglass base with a special white rubber formulation. The fabric is tacky, and has a plastic film surface covering that is removed before installation. The fabric will stick to itself once the film is removed. 550°F / 287°C Continuous rating: excellent sealing properties as a gasket material. Available in standard rolls of 25 and 50 feet. Curing: It is recommended that this material be cured in situ. This material must be heated to a minimum of 300°F within 60 minutes, then it must sit at 300°F or higher for 90 minutes for the rubber to fully cure. Do not overtorque the material during this curing time or the rubber will be squeezed off of the base material. If the material is not fully cured, the rubber will drip from the material causing voids. After curing the material can be exposed to a lower operational temperature.